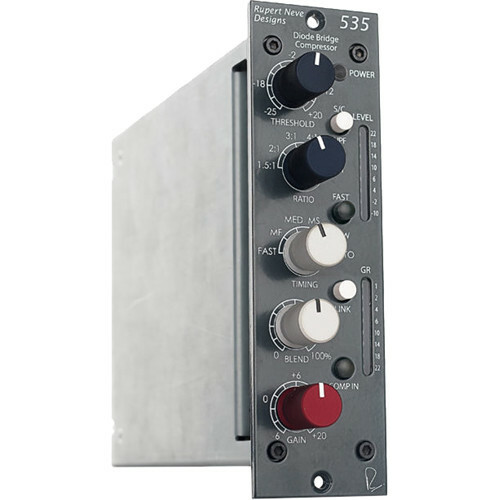 Designed as an update to Rupert Neve's legendary 2254 compressor, the Rupert Neve Designs 535 Diode Bridge Compressor is a dynamics-taming color piece designed for integration in 500-series racks. It's suitable for use in pro audio scenarios, particularly in the studio. This compressor takes the 2254's assets and helps eliminate its limitations by improving the noise floor, expanding the attack/release options, giving you a greater amount of threshold and ratio controls, and minimizing the effects of inter-modulation distortion. The unit uses a diode bridge as a gain control element to give you a pleasing, sonic character. Controls are on hand for Threshold, Ratio, Timing, Gain, and Blend. These controls are detented for accurate recall. A Link switch lets you operate two of these compressors in stereo. Meters give you output-level readings or gain-reduction readings. This unit is compatible with any compatible 500-Series chassis. It requires such a chassis to operate. This compressor is designed to deliver punch, vibe, and color. The character of the diode bridge provides a versatile update to a vintage compressor topology for the modern studio engineer. Threshold: This control has 31 detents, allowing you to adjust the point at which compression begins, between -25 and +20 dBu. Turning this control counter-clockwise will increase the amount of compression; turning it clockwise will decrease the amount of compression. If the input signal is lower than the set threshold, no compression will occur. Ratio: This control has 6 selectable positions on the rotary switch and lets you set the slope of the compressor curve, with pre-selected ratios of 1.5:1 through 8:1. This range of compression ratios allows you to compress very moderately, or if desired, dole out heavy compression to achieve an intentional effect on higher ratio settings. Timing: This control allows you to change the attack and release times simultaneously. Each TIMING setting has a different attack and release time constant. Due to the nature of this topology, these time constants will adapt themselves slightly depending on several factors: compression ratio, threshold, and source material. This allows the compressor to remain flexible with various types of source material. Fast: This control divides the attack and release times available on the Timing control in half, effectively doubling the number of TIMING presets available. Sidechain HPF: This control inserts a 150 Hz high-pass filter in the compressor sidechain. When this filter is engaged, the compressor will be considerably less responsive to information below 150 Hz. As an example, if used on a drum kit, the low end of the kick drum would be less compressed than the snare drum or cymbals since a significant portion of the kick drum’s dynamic energy is focused below 150 Hz. Blend: This control has 31 detents and allows you to mix the uncompressed signal with processed signal. Turning the control towards 0% will shift the mix to fully uncompressed dry signal, whereas turning the control towards 100% will shift the mix to the fully compressed signal. This feature allows for parallel compression by blending the direct and compressed signals, enabling a wider range of subtlety. Gain: This control has 31 detents and allows you to add makeup gain. As it is easier to evaluate the tonal effect of the compressor when levels are matched, the gain knob is crucial for making decisions as to whether the compression is helping or hurting. Comp In: This switch lets you audition the compression effect by engaging/bypassing the signal. Use this in conjunction with the aforementioned gain control.